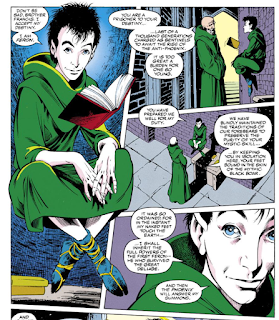 This is the first appearance of Feron, Alan Davis' latest effort to inject some new characters into the series. He is the latest in a familial line intended to serve as the host for the Phoenix Force, though it's unclear here exactly how that's supposed to work since the Phoenix Force has chosen two non-Feron hosts that readers know of already. 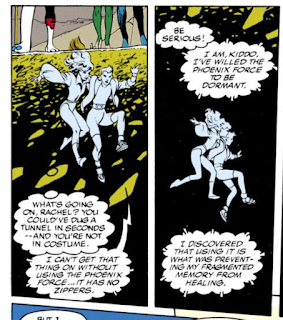 In addition to Feron, this issue also introduces the Anti-Phoenix, which is exactly what it sounds like, and turns out to be the entity Kitty discovered in the enclosed underground chamber last issue. It escapes and seeks out Necrom, its creator, who overpowers its current host and merges with it. 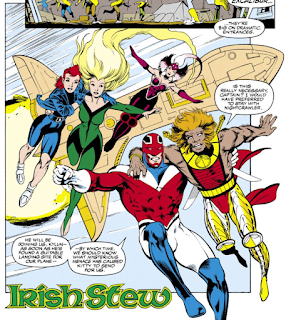 Both Kylun and Cerise travel with the rest of Excalibur to Ireland and help battle the Anti-Phoenix. I'm not sure if they're official members of the team at this point (whatever that means for a group like this), but they sure look like team members at this point. Kylun's mutant power is also established: he can perfectly recreate any sound he hears. Why this also turned him into a catman is unclear/unstated. Widget acquires a new look, after experimenting with body creation last issue, in which his round head/googly eye is replaced by a more angular head and shoulders along with some kind of energy based body with silver finger tips. 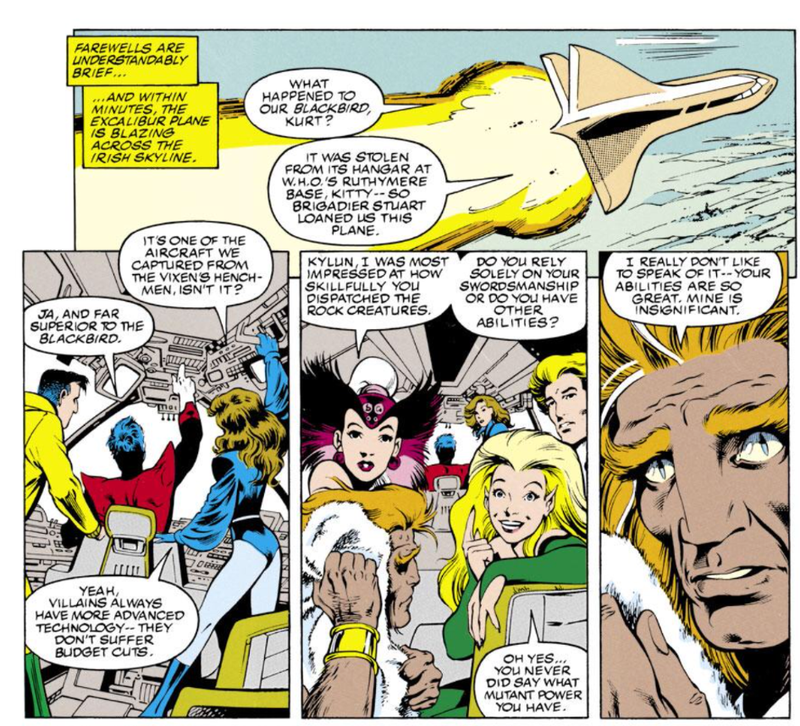 Exacalibur is flying a new plane on loan from WHO, as Professor X stole back their Blackbird in Uncanny X-Men #278. Rachel notes that her spiky red jumpsuit has no zippers, requiring her to use the Phoenix Force to take it on and off. Nightcrawler continues to take up the reins of leadership and run with it. In attempting to convince Rachel to give up the Phoenix Force, the Anti-Phoenix recreates the events of Uncanny #207, in which Rachel attempted to slay Selene and Wolverine stopped her by stabbing her with his claws. She says that now she knows Wolverine was right to do so, though I still maintain that savagely gutting her maybe wasn't the best way for him to make his point. Even though this picks up more or less immediately after the last issue left off, it still reads like Alan Davis getting down to brass tacks in terms of the story he wants to write, the one he's been slowly building towards since his return. Kylun and Cerise are effectively (if not officially) members of the team at this point, Widget finally gets a body and a new look, the original five are finally reunited after issues apart, a bunch of extraneous stuff (like Technet) has been cleared out and some questionable plotlines (like Possession) cleaned up, and the various plot threads involving Necrom and Phoenix and the origins of Excalibur are coming together (plus, Davis even gives himself a chance to draw some "greatest hits" moments from X-Men history to boot, through the anti-Phoenix' attempted seduction of Rachel). It's a pretty remarkable achievement, making this feel like both the start of a new storyline and the culmination of several, but Davis pulls it off. Tomorrow, Mojo mayhem in Wolverine #52. Next week: Incredible Hulk #393 and Marvel Comics Presents #90-97. Selene's got a pretty interesting view there in that last panel, huh? I think its safe to say at this point Excalibur is the best in the X-Line. Davis is able to incorporate the old continuity and dropped plot threads from Claremont/Davis early tenure and as you see here can introduce new characters and situations in a pretty seamless way. It still has the whimsical sci-fi/fantasy elements and lighthearted tone that made Exclaibur distinctive, but the plots move with so much more momentum than the never-ending Cross Time Caper, with some big payoffs for long in the work subplots. And the artistic talents of Davis/Farmer are so polished at this point. 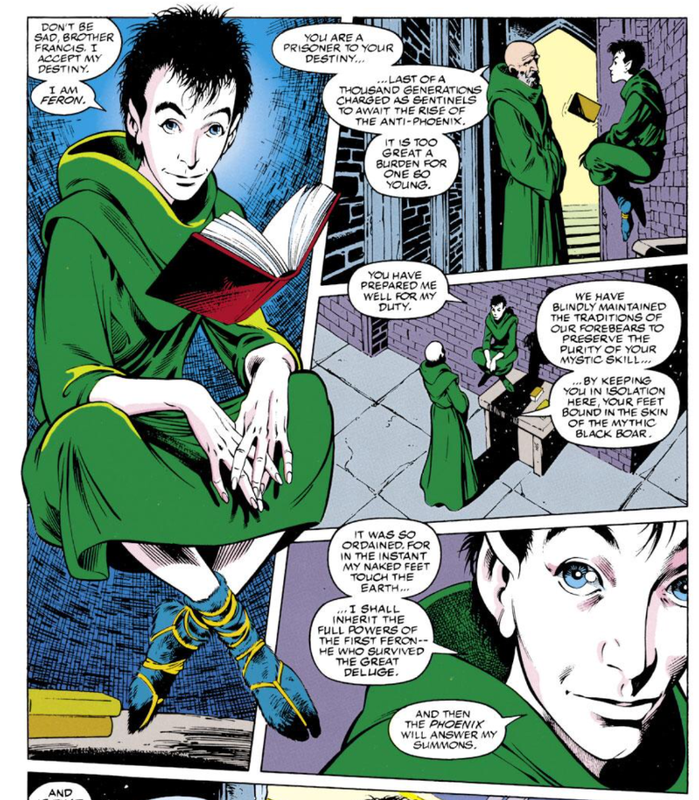 They look so clean and classical compared the Image crew on X-Men/Uncanny, but their work is more timeless. >> In attempting to convince Rachel to give up the Phoenix Force, the Anti-Phoenix recreates the events of Uncanny #207, in which Rachel attempted to slay Selene and Wolverine stopped her by stabbing her with his claws. She says that now she knows Wolverine was right to do so, though I still maintain that savagely gutting her maybe wasn't the best way for him to make his point. 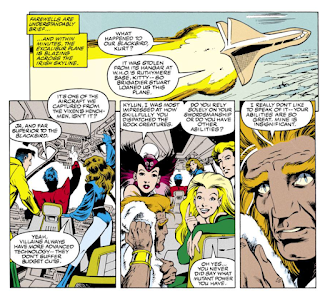 >> Exacalibur is flying a new plane on loan from WHO, as Professor X stole back their Blackbird in Uncanny X-Men #278. ... and now the SR-71 is hanging from the hangar ceiling at the X-mansion, as Forge made them whole new planes. That's like symbolic to what they did to Claremont's legacy. Claremont made it feel like they were using an actual plane for actual flying. The Forge ones are more of Action Figure Vehicles type of things. A commenter on CBLR points out it really was UXM ANNUAL #14 (1990) and not a later interview where Claremont confirmed his case. And Davis clearly did read it as that's where Rachel previously used the nickname Scrapper for Franklin. Me being convinced (the alt-future*) Logan really is Rachel's dad, the Antiphoenix choosing to use specifically her late husband Franklin and Wolverine for the hallucinations makes an extra sense to me, though Wolverine's stabbing her in itself obviously was the importantest event in her 1980's life. If we're, like, actively trying to forget that Secret Wars II really happened. 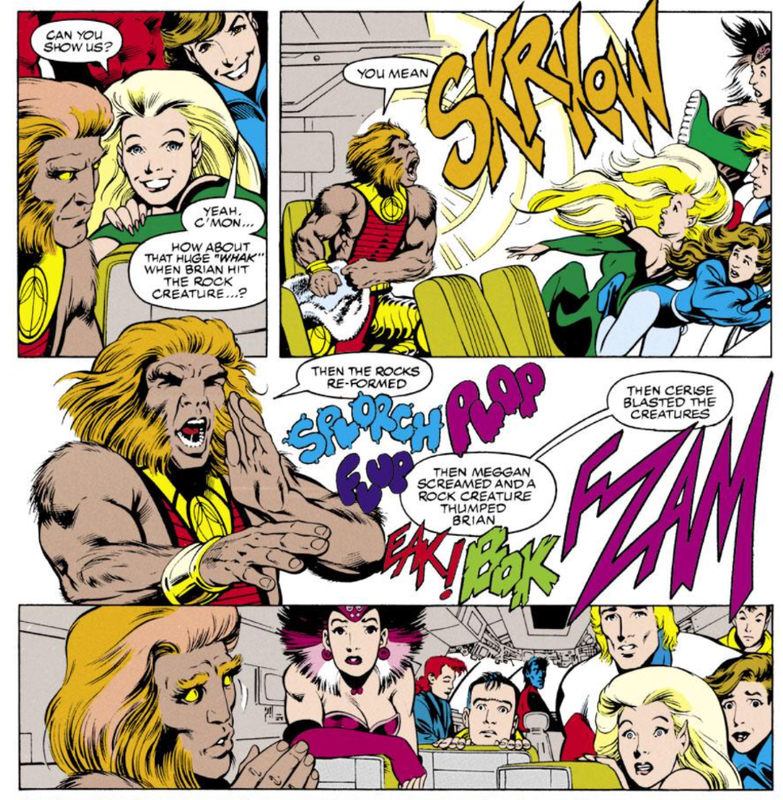 Given that both of them showed up at Excalibur’s HQ accidentally — or at least unintentionally, Kylun chasing Necrom through the lighthouse’s temporal/dimensional nexus and Cerise pulled off course by a vortex in hyperspace — pretty much immediately before the events of this issue, official membership is unlikely at the moment regardless of Davis’ long-term intentions. "Why this also turned him into a catman is unclear/unstated." I guess for the same Nightcrawler teleports and also looks the way he does? Granted, Kurt's case is a bit different, since he was born looking the way he did. I guess Davis just thought he would look cooler this way, or maybe some aspect of the world he was trapped on? "Nightcrawler continues to take up the reins of leadership and run with it." Some nice character growth for our Fuzzy Elf. Some really good stuff here. The weakest thing is the cover, which is probably Davis' least inventive, especially coming after the one we got last issue, which is a favorite of mine. But overall, some strong stuff here, both in the writing and the art. 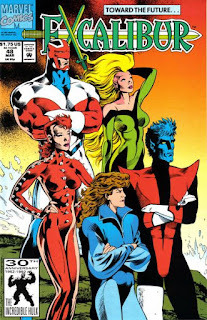 It's too bad people associate early 90s X-men with the Image guys, since this title is giving us the exact opposite; well written long term plots which pay off, great character work, tying up loose ends, all while moving the story forward. And it looks gorgeous too. I wish Davis stayed on the title longer than he did. 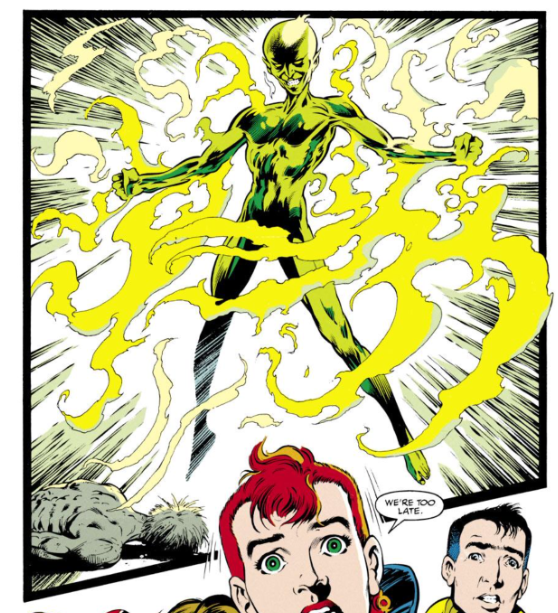 I'm fine with the idea that Kylun's look is just a random side effect of his mutation (not unlike Nightcrawler's appearance); I was merely pointing out that the text hasn't yet acknowledged as such, even as it made a point to spell out his power here. I like this issue, but I'm not a fan of the cover. Everyone looks kind of unnaturally posed to me. The cover is not good. Aside from the unnaturalness of the poses, it's also terribly generic. It's much more like the generic covers of the 00s and 10s than what we were still getting even in the 90s. It's again one of them anachronistic jokes the universe is playing on us. Only few years later a musical artist by the name of Scatman John will surface to perform Euro techno dance pop very reminiscent of Kylun's sound effects here, and instead of the appropriate questioning utter shock reaction shown by our heroes, he will be meeted with top positions on several music charts. So, he's the catman, be-bobbabbolobbo.